The house sits along Taylor Creek and large windows provide views of the confluence of two bold creeks and the dramatic boulders rising above that confluence. 800 feet of creek front runs along the property and around a private island in the creek. 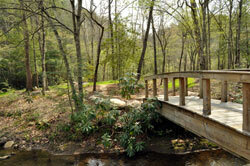 The creek offers terrific places to explore all the nuances associated with the life of a mountain creek. With 9 acres there's been plenty of room for the organic gardening, established blueberry plantings, a summer flower garden and scuppernong arbor. Some old Stayman Winesap apple trees remain from a long ago homeplace. Wild persimmons are here along with chestnut trees. From the kitchen window one can view a spring fed reflection pond that provides a venue for seasonal frog choruses, otters cavorting, blue herons, wood ducks, mergansers, and once upon a time an elusive weasel. In the yard you will see kingfishers dining on crawfish, deer families walking across the creek, turkeys snitching blueberries and a year-round selection of many songbirds that come to eat native plant seeds and drink creek water. The outbuilding can house farm equipment, rv storage or a huge hobby space. The guest cottage was long ago an old pole barn that over the years was transformed by the previous family and then again by us into a charming attic style cottage overlooking Taylor Creeks. The downstairs can be used for hobby space, art studio or a workout room that opens directly to the creek. Between the house and guest cottage is the ruin of an old cottage. The stone walls still stand along with the working stone fireplace. The ruins offer a place to gather by the fire in the evenings. 220 acres of community property are surrounding the 9 acre homeplace. Walk or hike the extensive trail system, visit the two waterfalls in the boulder strewn mini gorge, read a book at the library cabin or walk to the swim pond and sit at the pond's gazebo. Even the roadways are great walkways as there is minimal traffic to encounter. There is much to offer any native plants enthusiast at Three Creeks. Spring here is stunning and the waterfalls and creeks offer their own plant habitats. an eclectic small city can possibly offer. We purchased this land from a multi-generational family that had a large life here for years. They built cottages, sheds, gardened, explored, camped, shared meals, and then they grew up or got old and moved along different paths. They came by the land when one of the family members was a local magistrate and a Mr. Charlie Logan owned this land. Mr. Logan made moonshine to support his family and the sheriff kept catching him making illegal whiskey. Mr Logan had no money to pay bail so the magistrate paid the bail and the magistrate acquired this land in exchange for payment, piece by piece. You can see where this is going. Some of elders in the Bill's Creek community remember when they could walk to the Logan house and buy a shot of 'shine for a small coin. There was also a grist mill located downstream from the lower falls and remnants of the stone foundation are still visible. One can find the occasional arrowhead that lets you know that long ago this land was inhabited by native Indians. They would have highly valued the creeks, bottom lands, forested hills, wildlife and giant boulders for shelter from weather.